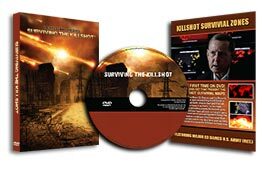 "Surviving the Killshot" DVD and Maps. *Each attendee will also recieve an exclusive free copy of Surviving the Killshot DVD and survivial maps at the workshop! This is your free gift to share with your close friends and loved ones regarding preparing for the approaching Killshot. Live 2-Day Workshop October 10-11, 2015 - Reno NV. Execute real-world practice and enigma targets with feedback. Learn the personal sanctuary Remote Viewing ptotocols. In-depth lessons on how to identify sanctuary locations. Access to the private evening chats with Ed Dames. Ask Major Dames anything you want to know! See and discuss Killshot survivial zones map. Discussions on personal Killshot sancutaries. Commonly Asked event Questions and Information. What is covered in a workshop? What is my free DVD gft for attending? What is the evening chat with Ed Dames? Workshop training from Major Ed Dames is not just another lecture about practice or theory like so many "other" RV seminars or workshops. This is a real HANDS-ON training program from the most comprehensive and effective RV source in the world! The live workshops cover a wide range of activities and topics from basic Remote Viewing training to improving and refining your Remote Viewing skill to utilizing RV in real-world applications and projects. Attendees will be taught, step-by-step, the most effective and up-to-date Remote Viewing protocols and execute several blind targets throughout the class. Each target is followed by instant feedback in order to compare your own data with other student sessions! You'll know right away that you're really learning this groundbreaking skill! Periodically throughout the workshops, Major Dames will also be checking student sessions; identifying where pitfalls may be to provide personal attention and tips to increase your accuracy and solidify your understanding of the "RV" process! The Remote viewing Killshot Sanctuaries training workshop will also have an emphasis on learning Remote Viewing in order to locate your personal sanctuary location. When and where is the workshop being held? This Remote Viewing workshop is held between 9:00am-5:30pm on Saturday and Sunday and includes the exclusive evening chats with Major Ed Dames after dinner between 7:30pm-10:30pm. For your SPECIAL ROOM RATE on Friday, Saturday and Sunday at only $69/night (Fri & Sat) and $39 (Sun), please call 775-356-3300 right away and tell the operator to use group code "GRVP". Block rooms expire when filled so register early. In addition to your workshop training workbook and access badge, each attendee will receive a free copy of the Surviving the Killshot DVD documentary and survival maps booklet from Major Ed Dames that you can share with your friends and family! The content presented in this DVD showcases each region of the world with associated survival and death zones for the coming Killshot sequence of events and highlights the basics of what is needed to survive for the short to the long term future. Also, you'll see several past Remote Viewing predictions being showcased with overwhelming evidence of their passing to share with friends and family that presents the true power of learning and using Remote Viewing! This is an exclusive gift from Major Ed Dames and it CAN NOT be sold or copied. A signed release form is necessary for you to receive your copy of the Surviving the Killshot DVD and booklet. After each day's training sessions have concluded, attendees will have access the evening "private chats" with Major Ed Dames. This is a casual and private chat with Ed in which you can ask anything you have on your mind; including Killshot sanctuary questions. This is a behind-closed-doors period with no cameras, no voice recorders and no staff. Just the class with Ed so any topic brought up can be answered by Ed.